In this daring and big-hearted novel based on the Hugo-winning short story, the lovelorn navigate a world in which technology has reached the outer limits of morality and romance. This novel is, without a doubt, unique. When I began reading it I tried not to have any preconceptions of what to expect – from the blurb I knew that I would be reading a love story set in a high-tech world; I wasn’t expecting aliens or spaceships or epic weapons, and neither should you. Rather, expect something new. For instance, the tale’s opening scene: a woman, woken from some sort of coma – except she hasn’t been in a coma. She’s dead, has been for years, and she’s been drafted (without her consent or knowledge) into what is basically a dating service. What a premise, right? Yep, I was hooked from the beginning, too. You see, what this story does is explore love, relationships, and friendships against a backdrop of immortality and social media – death has been eradicated, though the price is beyond exorbitant; you can live a life of influence, with all the notoriety and success that comes with such a life, but the price you pay for it is your privacy. Each character’s tale explores aspects of this world: Rob’s path takes him into the meat and tech of the world, revealing just how insane such a world can be, yet at the same time offering a glimpse of the happiness everyone is searching for; Veronika finds herself in that quintessential Catch-22 situation: able to give advice but utterly unable to follow advice. And Mira’s situation is perfect at exploring just how we are forced do to things that aren’t in our character if it means we have just a chance at finding what we’ve been searching for. And the tech in this tale is at once dazzling and terrifying – I really hope that Will hasn’t had an accurate vision of the future, but unfortunately I can’t help thinking that advances in technology coupled with social media are taking the world in exactly this direction. We already live in a world where being connected (whether it’s via Twitter, Facebook or InstaGram) grants you a certain social status – if you’re connected then you know what’s happening in the world from instant to instant, leading you to believe that you’re informed and can have a knowledgeable opinion, but the cost, as explored in this tale, is that you know more about the world and less about your loved ones, and even yourself. 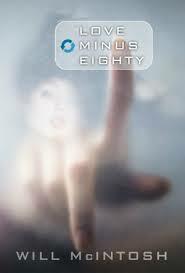 “Love Minus Eighty” is an excellent read, at once an exploration and a vision of just how we, as emotional beings, continue to try and live alongside technology that can either increase the distances between us or bring us closer together. Highly recommended! To order your copies of “Love Minus Eighty“, click the following links: Exclusive Books, Book Depository, Amazon US, Amazon UK. And check out Will’s website for more info on him and his work.